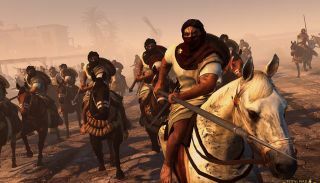 The Hun-ish strategy game Total War: Attila is about to add three new playable factions— the Aksum, the Himyar, and the Tanukhids—as part of the Empires of Sand "Culture Pack," which is set for release next week. The expansion will also add new campaign and horde mechanics, events, some big new Religion features, and more than 50 unique units. Befitting their origins in "the harsh deserts of Africa and the Middle East," each of the new factions enjoys a +2 Sanitation bonus in all regions, +15 melee attack in desert battles, and immunity to desert attrition. The Aksum and Himyar may also choose from two separate main religions, each with its own building chain, tier-five barracks, and victory conditions. Each religion also has an increased impact on diplomacy, meaning that players must "choose their religion carefully based on who they wish to ally with." The Tanukhids, as a horde faction, can't select from multiple religions but do have their own unique benefits, including a new building tree and the "Legendary Raiders" trait that reflects their "hyper-aggressive" style. The Empires of Sand Culture Pack is set to go live on Steam on September 15, and can be preordered now at a ten percent discount off the regular price of $7/£5. That same day, developer Creative Assembly will also release an update to Total War: Attila that will add "free additional playable faction content" for all players. Details about that update will be revealed ahead of its release.